Vernon grew up working in Dad's shop, absorbing shapes from his father, M.L. Owens and his uncle Walter Owen, who worked at North State Pottery in Sanford. In the late 1950's, at the age of fifteen, he went to work also for C.C. Cole making as many as 200 small pieces a day. The economy was in hard times and a good product that sold was something to be proud of. While Vernon worked hard to make good pots, he did not think of himself as an artist. In 1960, John Mare, the new owner of Jugtown Pottery, hired Vernon as the Jugtown thrower. Here, Vernon was encouraged to hone the skills he had developed as a youngster. At first he dutifully copied the forms of early Jugtown pieces but that became a frustration and he began to let the old pots be an inspiration to develop his own forms. After Mare's sudden death in 1962, Owens leased the pottery and kept it going until 1968 when it was sold to Country Roads, Inc.
Vernon continued at Jugtown Pottery through the ownership of Country Roads, Inc., a nonprofit corporation whose mission was the preservation of hand crafts. He worked closely with the director, Nancy Sweezy, learning glazing and business techniques. In 1983 Country Roads, Inc. moved on to another project and Vernon bought the pottery. He married potter Pam Lorette that same year. While Vernon sells the majority of his pots at Jugtown, they can occasionally be seen at gallery shows and in museums. The main influences in Vernon's pots come from the Moore County, NC pottery tradition, (the utilitarian wares such as jugs, pitchers and churns made in the 18 and 19th centuries), and the art pottery era which began around 1917, from which classical vases and bowls from Korea, China and Japan became the inspiration. Vernon received a North Carolina Folk Heritage Award from the NC Arts Council in 1994. In 1996 he received a National Heritage Fellowship from the National Endowment for the Arts. Vernon received an Honorary Doctor of Humane Letters from North Carolina State University in December of 2000. He was also part of the Carolina Preserves project with artist William Mangum in 2000. A love of traditional pottery and a potter named Daniel Goodale from her mother's lineage, initiated Pam Owens pottery career. Her first pottery teacher Isobel Karl, who attended Alfred College during what she called, "the golden years", strongly influenced Owens decision to study pottery by apprenticeship. Seven years of pottery apprenticeship, the traditional method of pottery study, began with two years at High Mowing, a small Waldorf School in New Hampshire. 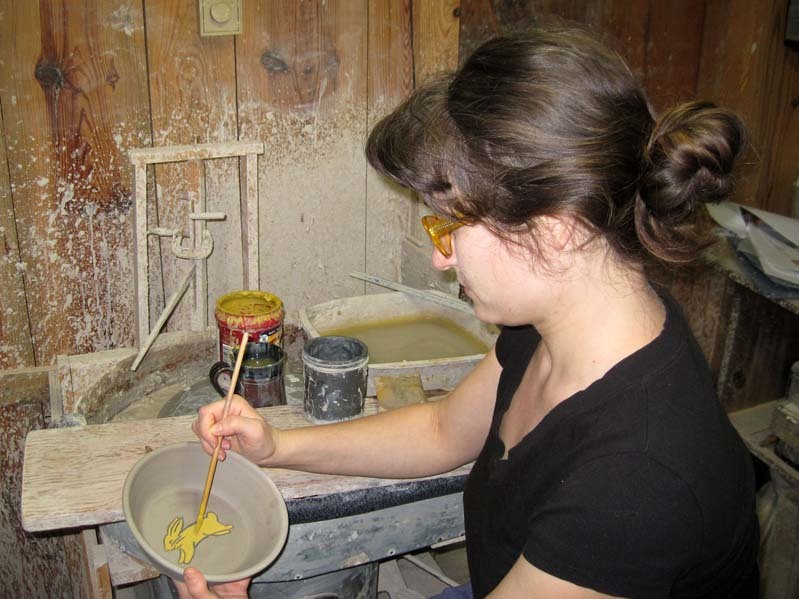 After studying in a school environment and a three week study at Wolff Pottery in Connecticut, Jugtown Pottery was her first working pottery experience. There she learned throwing skills through practice and watching Vernon Owens, a very skilled potter at work. The apprentices also worked in the glaze room and the sales cabin. Returning to N.H. to attend UNH, Owens found work throwing early American reproduction ware and loading kilns as part of the employment/apprentice process. In 1979 she apprenticed at the Chesire pottery in N.H. and returned to Jugtown in 1980. In 1983 she and Vernon were married and have worked together since. Owens states, "How I landed at Jugtown and this wonderful state that so appreciates clay, still mystifies me, but I am honored to be part of the tradition and do my best to keep it alive, evolving and yet connected to its history. The forms at Jugtown are always subtly changing. We work from the tradition but are not strictly bound by it." Pam served as a North Carolina Pottery Board Member from from 1999-2002 and again for several years until 2011. She served as a juror for the 2004 Artsplosure Fine Art Festival in Raleigh NC which will be on May 2004. Pam's work can be seen in the following publications The Potter's Eye by Nancy Sweezy and Mark Hewitt, 500 Animals in clay, a Lark Ceramic Book and The Remarkable Potters of Seagrove by Charlotte Brown. 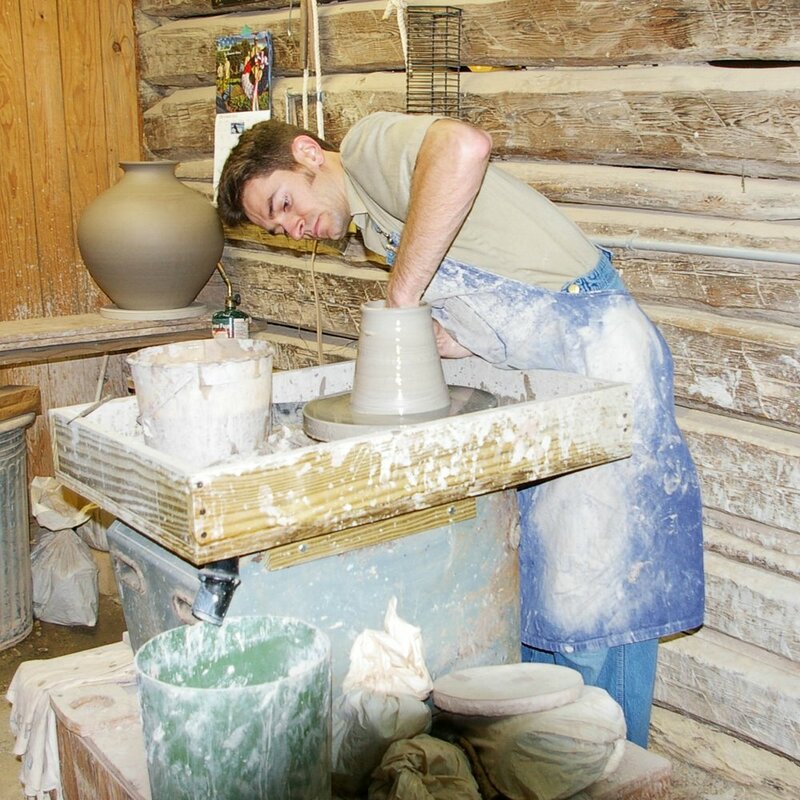 Born in 1985, son of Vernon and Pam Owens, Travis began making pots at age 2. He is known for making traditional wares like those of his great grandparents, J.H. and Martha Scott Owen as well as early Jugtown shapes, chickens and pigs. Travis has led workshops at the North Carolina Museum of History and the McKissick Museum, and demonstrated at the Novella Festival through the Mint Museum, as well as at private schools. He has exhibited at Jugtown, the Catawba Valley Pottery Festival, The Mary Hambidge Center and the North Carolina Museum of History. Articles and videos include: " US Kids" in 1990; North Carolina Social Studies, Grade 4, "The Life of a Young Potter", 1995 and Southern Living 2004. Born in 1990, daughter of Vernon and Pam, Bayle began making pots at age 2. She completed her first dinner set in 2000. She demonstrated at the Novella Festival through the Mint Museum in the late 1990's and appeared in an article in "Kids Guideposts" in 1995. Bayle is featured on the http://www.handsoncrafts.org web site developed by The Public Library of Charlotte and Mecklenburg County. She can be seen on the Craft in America series, in the Origins, Jugtown episode. Bayle studied art at Warren Wilson College from 2008-2009. Following her heart she studied fiber art at Haywood Community College 2010-2012. She joined her family at Jugtown and makes functional pieces and is known for her pumpkins, clay animals, and sheep felted with fleece. Bobby unloading kiln he has fired. Born in 1939, Bobby is the son of M.L. Owens. He grew up helping with loading kilns and cutting wood for firing kilns for his father. He was hired by John Mare in 1960 to glaze, load and fire kilns at Jugtown Pottery. His love of the process of clay and glazes kept him busy at Jugtown. He continues to work mixing clay and glazing and firing of the cone 6 gas kiln. He is a integral part of the process at Jugtown. Ikuko Hussey, "Sukoshi"! She keeps Jugtown organized and the can be seen in the sales cabin. Jennie Keatts of JLK Jewelry We have a case of her wonderful jewelry; many of the pottery stones in her pieces are fired at Jugtown.